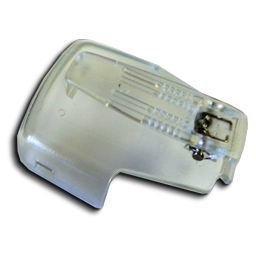 The plastic replacement cradle you get as standard with the 4 line alphanumeric pocsag pager from LRS. This cradle may look fragile, but nothing could be further than the truth. Its made of premium materials and is extremely robust. This is a cradle that is original equipment and no other cradle fits. An alternative is our pager protector leather case only from LRS UK. It's worth bearing in mind that this pager cradle is not simply made from 'plastic'. In fact the cradle is made from some of the strongest materials available for this type of use - Lexan. Both the cradle and belt clip are extremely robust and we don't often get requests for replacement clips as shown here. The 4 line alphanumeric pager cradle with clip. This cradle securely holds the pager in position. Consider buying our pager protector made from leather type material which has a belt clip integrated to the case which could help to save money and protect the pager from any type of accidental damage such as being dropped on the floor. The difference in cost will be reaped many times over when you use protection cases as opposed to the original clip. The four line alpha TEXT pager from Long Range Systems UK is one of the smartest units available anywhere. Great feature range and can work from a single AAA battery for up to 6 months.